Hostel Quetzal welcomes groups of up to 40 persons. Amazing space with air conditioning, and ensuite bathroom great for friends traveling together. meals available on request or box lunches for touring days. -A friendly place to stay in Mexican home. A home designed for enjoying life, focusing and relaxing. 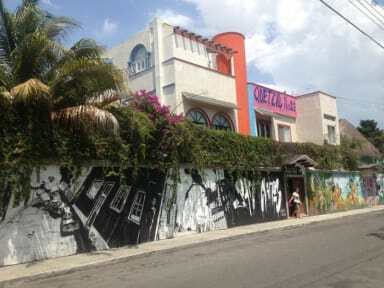 -LOCATION We are located in the centre of Cancun in front of The Art Park. 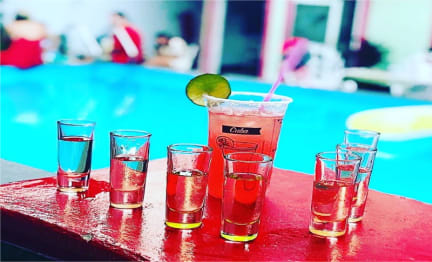 Here you can experience the real culture of Mexican Maya Region with local food, crafts, markets and street art with everything at real Mexican prices. - 10 minute bus to the bustling Zona Hotelera with gorgeous white beaches and world famous nightlife. We really have the best of both worlds. PRIVATE ROOMS are available for one, two, or three persons. -All rooms are distinctive in design and color. The rooms are spacious with high ceilings, arched doorways and large windows. -All private rooms have a private balcony, terrace or garden patio. Fully equipped with air-conditioning, ceiling fans, full private bath, wireless internet access 24/7, hot water, towels, beach towels and sheets. Rooms for family travellers and best buddies who want a bit more space to themselves, The rooms have high ceilings, tiled floors, ensuite bathrooms, air conditioning and ceiling fans, lockers and large doors which open onto a private patio with hammocks. Our dorm was originally a rehearsal studio creating large shows with trapeze acts, musicians, dancers, and acrobatic performers with the Aves del Paraiso entertainment company. The oversized room has air-conditioning and ceiling fans, wide open spaces, and large windows. The bathroom is conveniently ensuite and comfortably designed for men or women. The staff here is so friendly, they Will try to help you with Everything ! Also the atmosfer is Great. The hostel Has a Nice bar and swimmingpool and Has all kind of tours you can join, Like go to cocobongo. We had a lovely time here ! - nice free breakf & dinner. Close to busstation, good to socialize -staff can be a little more friendly, did not feel welcome at all.